I recently returned to chilly Chicago after 8 days away from home. Six of those days were spent in Las Vegas-- first, working a conference that my company hosts each year and then a couple days on the tail end spent vacationing with my husband. That is a LONG time to spend in Sin City and I am happy to be home. And while I won't miss the tourist trap prices, the weirdos, or the seedy smoky casinos, I will certainly miss the food! Las Vegas Never disappoints when it comes to dining options and spending this much time there, I was able to take full advantage. Today I am sharing some casual dining spots with you-- perfect for lunch or a low key dinner. Come back Thursday to read about two excellent high end restaurants too! El Segundo Sol is a lively taqueria conveniently located in the Fashion Show Mall. This restaurant is part of Lettuce Entertain You, a Chicago-based restaurant group that is synonymous with quality food and great service. El Segundo was no exception. We were there with a large party and many different dietary restrictions ad our waiter was both attentive and fun. And from the appetizers to the drinks to the entrees, the food was delicious. We started the meal by sharing a variety of appetizers. When it comes to Mexican food I am partial to anything that involves dip and we sampled plenty of options. Their housemade guacamole was super fresh and could be customized to accommodate the preferred level of heat for your table. We also tried the queso fundido. I can usually take or leave this appetizer, but this one was quite good with cheese that was melty and creamy (not rubbery) and a healthy amount of crumbled chorizo. It was served with warm housemade flour tortillas. 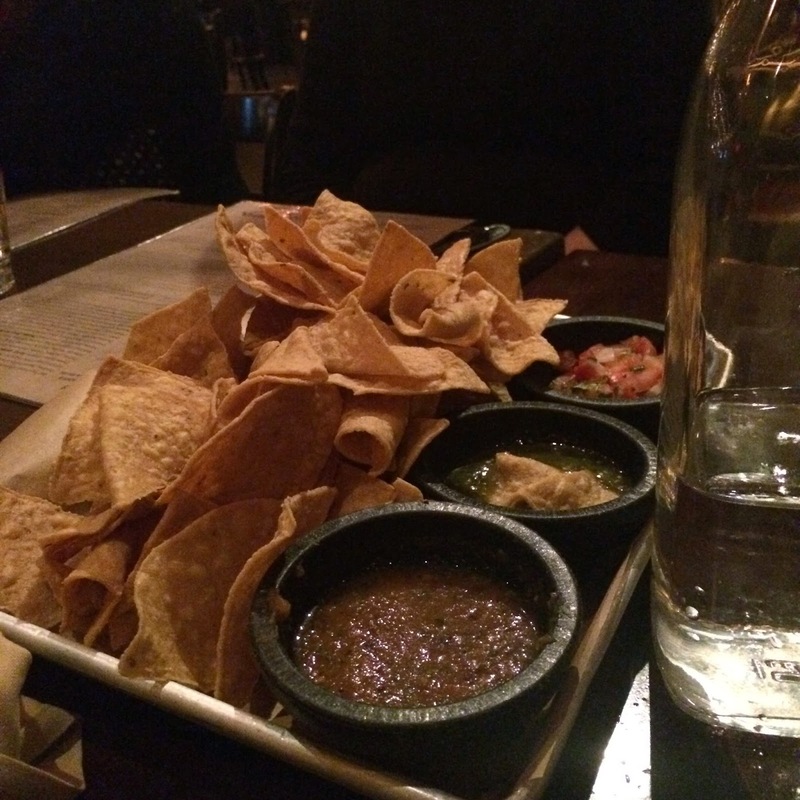 My favorite appetizer was the simplest one of all: the chips and salsa. I could have made a meal out of the warm freshly fried tortilla chips and the three salsa options: a freshly diced pico de gallo, a smooth and spicy roasted tomato salsa, and my favorite-- a tangy and slightly spicy tomatillo salsa verde. After eating about a thousand tortilla chips and knowing I had almost a week's worth of Vegas dining ahead of me I thought it wise to order something on the healthier side for my entree. Ordering veggie tacos can be a real gamble and to say that I was surprised by how good these were would be an understatement. These were the best vegetable tacos I have ever had. My plate arrived with an assortment of perfectly grilled asparagus, bell peppers, onions, corn, and jalapeños. It was a great selection of vegetables that were cooked and seasoned well, which can be very tough to do. They were served along with soft homemade corn tortillas and sour cream and that delicious salsa verde for assembling my own tacos. On the side were some tasty black beans and their signature cilantro rice. I cleaned my plate and have never thought I would enjoy a vegetarian taco so much! The Wynn is known to be one of the most upscale hotels and casinos on the strip offering some of the best fine dining options in the area. One of the wonderful things about the Wynn is that even their "casual dining" options are still top notch restaurants like Allegro, a fabulous Italian restaurant located right in the Wynn casino that I told you about last year. This time around we ventured to the other side of the casino to give Red 8 a try. Red 8 serves a variety of Asian cuisines in an elegant setting overlooking the casino at the Wynn. The menu at Red 8 is extensive with everything from dim sum to noodles to fried rice and Asian barbecue options. 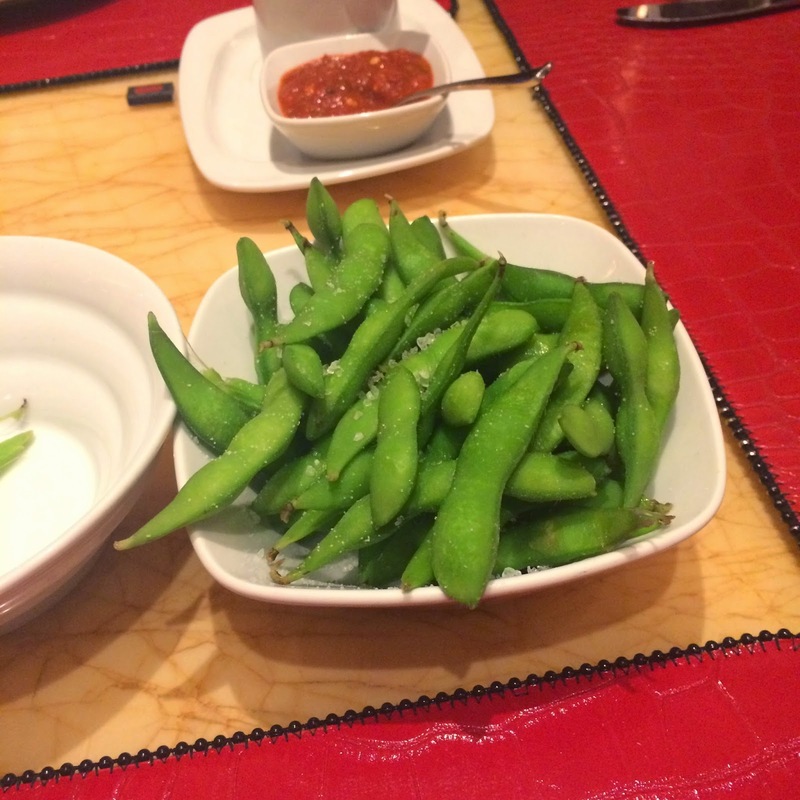 We decided to share a few items among the table before our entrees, starting with some simple salted edamame. It's one of my go to's at Asian restaurants and felt like a healthier option to start off this meal after a few days of overindulging. We also decided to pick something off the dim sum menu too and settled on the steamed BBQ pork buns. These were a big hit with everyone at our table. The buns were perfectly steamed with a fluffy and light texture and the filling was really delicious: tender shredded pork in a savory peanut bbq sauce. It was a simple and tasty way to start off the meal. When it came time for entrees, all three of us opted for noodles, but in 3 very different preparations. My husband opted for the super spicy Panang-style rice noodles with steak and my friend Kerri opted for classic Chinese chow mein with chicken. I'm a big pad thai lover so I went with the pad thai rice noodles with shrimp. The portion (on all three of these) was huge. I only made it through half my dish, but it was exactly what I was craving: four large steamed shrimp over a huge amount of pad thai noodles with scrambled egg, tofu, sprouts, and a little green onion. The noodles were tossed in a classic pad thai sauce with peanut and lime, though I made the mistake of pouring in more of the peanut crumble (which came on the side) into the pad thai, not realizing that it was heavily seasoned with red chile flakes. The dish was super spicy, but delicious nonetheless. If you're craving Asian food (without the greasy takeout quality), this is a great spot to keep in mind. If there's one thing that Vegas is known for on the dining scene, it is definitely the buffet culture. Every casino has one, they're all a little different, but they all have one thing in common: Tons of food. 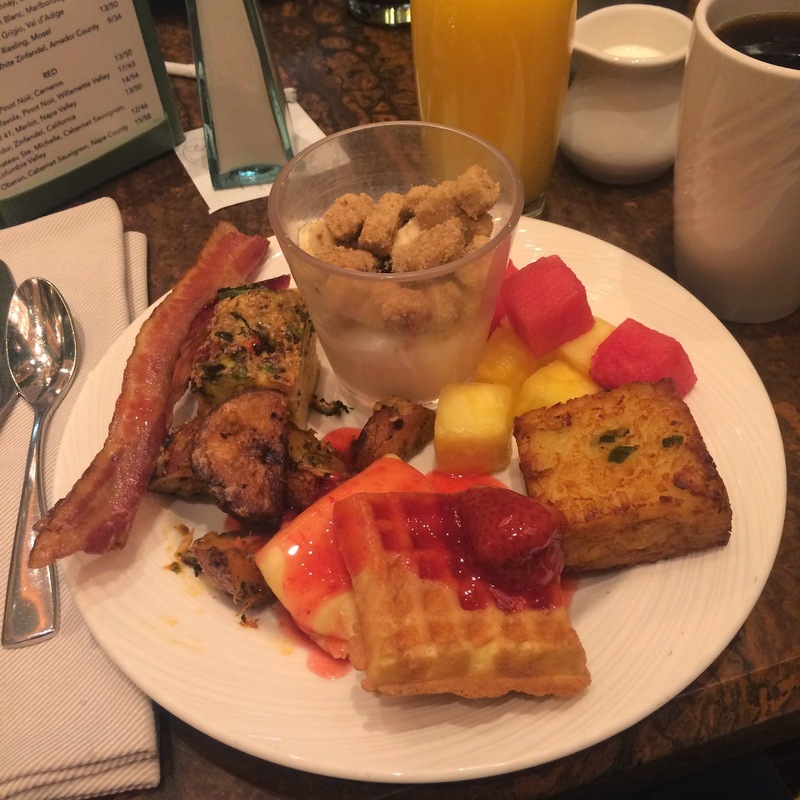 I had heard from several people that The Buffet at The Wynn was one of the best on the strip and since we were staying there, Alex and I decided to visit for brunch on our final day in Las Vegas. Buffets aren't really my scene, but when in Rome, right? The spread here is really impressive-- with all of your typical American breakfast staples available along with Asian and Mexican options, an omelet station, a pancake station, and a full bakery counter. While there were some definite hits among the food that we tried (like the yummy cheese blintzes with strawberry or apple sauce and the flaky pain au chocolat), there were also some misses (like the fishy-tasting lobster and asparagus frittata and the super dry jack cheese hashbrowns). If you're looking for bang for your buck-- especially at The Wynn-- then the Buffet is a great option for hungry guests. Given the choice of buffets though, I would head down the strip to the Cosmopolitan to The Wicked Spoon. I dined there a few years ago and they offered a few more creative options as well as several items that were already pre-portioned and served in individual dishes, preventing the dreaded buffet plate cross-contamination. Before we departed Las Vegas, Alex and I sat down for a late lunch at Yardbird. We stumbled upon Yardbird while walking through The Venetian's restaurant row and loved the look of their low key southern-inspired decor, which was such a fresh change of pace for the over the top cheesiness or gaudiness of so many Las Vegas bars and restaurants. It seemed like the perfect place to stop in for a cocktail and some good food before boarding our plane out to LA. We pulled up a few stools at the bar and chatted with the bartender (a Chicagoland transplant) who helped us select some of Yardbird's more popular menu items. His first suggestion-- my cocktail order-- was a good one: Yardbird's signature blackberry bourbon lemonade. Buffalo Trace bourbon was combined with fresh blackberry puree, lemon juice, cardamom (such a good addition! ), and Angostura bitters. It was tart and sweet and the bourbon was just strong enough. It was a really nice refreshing cocktail! For food, Alex decided to go with a few snacks: deviled eggs-- which are always a 'must order' for him (I should make him write a deviled egg round up here someday)-- and a side of the house-cut fries. 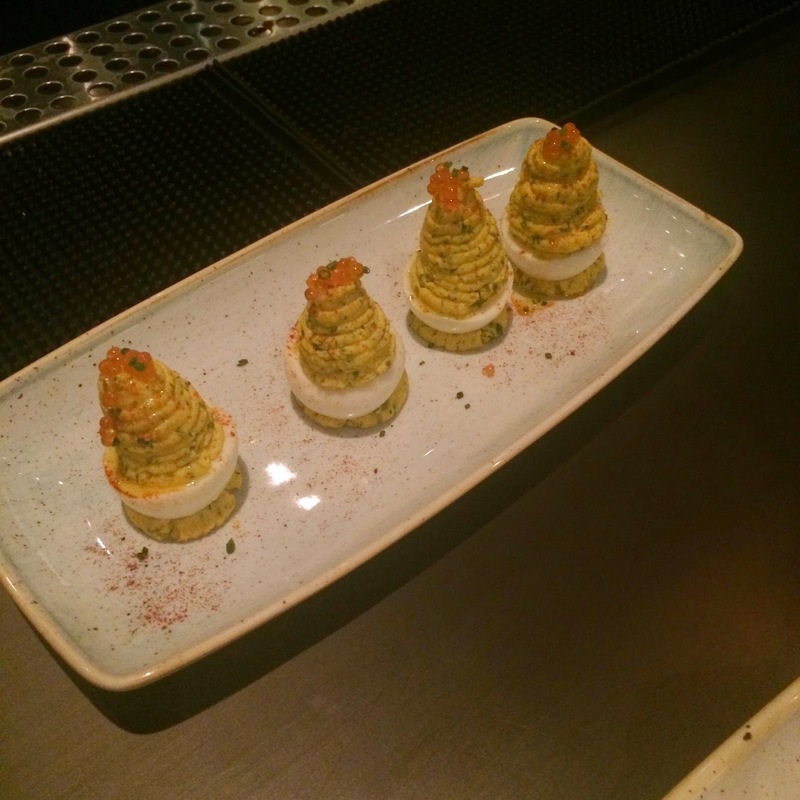 The deviled eggs were piled high with a generous amount of chive-seasoned filling topped off with trout roe a.k.a. "redneck caviar," as their menu called it. I'm not a deviled egg girl, but Alex loved these. They were too big and messy to eat with your hands, so they are definitely a fork and knife snack, but a great size for sharing. I'm not opposed to french fries at all, so I stole several off of Alex's plate because these were really good ones! The hand-cut fries were thick and crispy and tossed in a bacon salt that was unbelievably tasty. 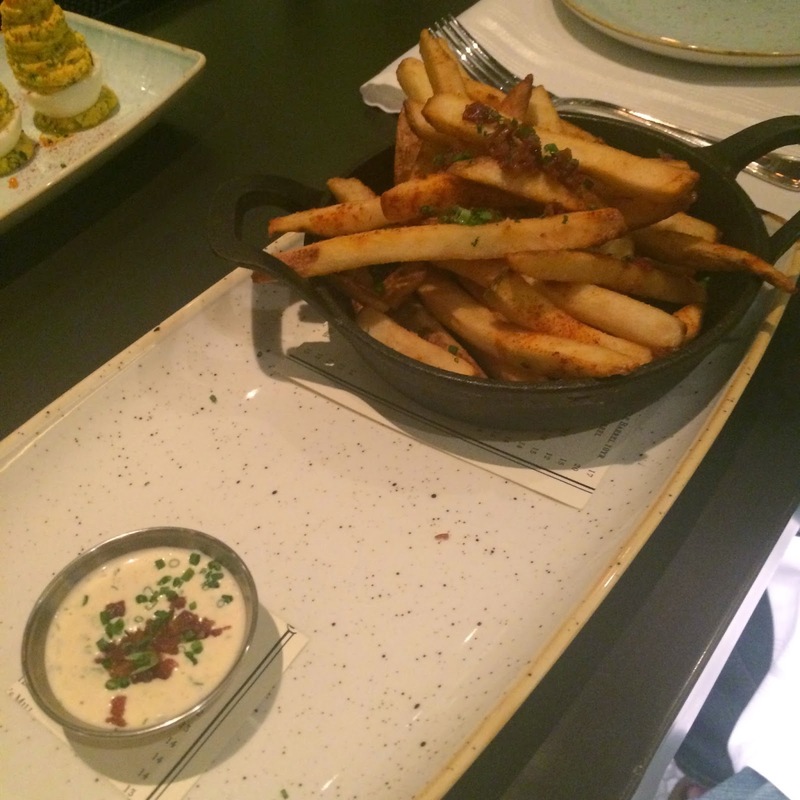 They were served with a buttermilk dressing on the side for dipping that took these already indulgent fries over the edge. I would definitely recommend an order of these to share at your table. I ordered the Low & Slow Smoked Chicken Salad, which the bartender mentioned was one of his favorites. This was not your average salad at all. It started with a slice of cornbread that must have been pan-fried because it was crispy and crunchy and not soggy under the rest of the salad toppings. It was topped with fresh diced avocado, corn, and pulled smoked chicken that was moist and flavorful. This was all finished off with a lightly dressed frisee salad and a tangy yogurt dressing. The flavor combination here was really delicious-- like a fresh California-influenced plate of southern food. This was so hearty that calling it a "salad" felt like a stretch, but it was a perfect portion and frankly, it felt light compared to the heaviness of most of the food we'd been eating in Vegas all week. Yardbird was such a fun place to stumble upon-- perfect for brunch, lunch, or dinner (where they also offer some great southern specialties like shrimp & grits or fried chicken in plates sized for sharing) or just for a cocktail and a few snacks too. I love Wynn hotel in Las Vegas. In my opinion it is the best hotel there. I was with my girlfriend there last year. We booked the rooms with http://www.reservationcounter.com/hotel/las-vegas/ and we had an amazing time. The restaurant there is amazing. It is definitely recommended.